With the first roster cut downs set for Tuesday at 4:00 pm Eastern, the Patriots need to bring their roster down to 75 players. With uncertainty surrounding several positions, I indicate players that I consider locks with ( ) around their name. Each position is numbered with a loose depth chart. I have 54 players currently, but that is solely due to Blount being suspended the first game. Top candidates to be cut once he returns include Travaris Cadet and Dion Lewis. (Jimmy Garoppolo) - Despite some issues here and there, Jimmy G. has shown more promise than any other Patriots QB has since Brady himself. His athleticism allows him to rollout, scramble, and pick up yards with his feet, something that Brady only does when he wants to show off. Garoppolo may not start for some time, but when he does expectations will be high. (LeGarrette Blount) - Continuing his reign as the best RB on the Patriots roster hasn't been easy with the interior of the OL being shakey without Bryan Stork playing, but Blount still has that special style. He should look to be the workhorse out of the backfield and may need to find new ways to get help blocking with Develin possibly done for the year. (James White) - White will make the team and has shown what he can do with the ball in his hands. Few players can wiggle and stop on a dime quite like James White does. His ability to catch the ball and make moves in the open field will be key on third downs when other options are covered. Brandon Bolden - Bolden has done next to nothing on offense during the preseason, as has been his normal over the last few years. That's not where he thrives though. As one of the best special teamers on the team, he will make the roster and likely contribute on numerous special teams units. Jonas Gray, RB - Gray has had a decent preseason so far in terms of production, but the biggest thing keeping him on the team is the fact that no other Patriots RB can pound the rock quite like he can outside of Blount. If Blount were to go down, the team would struggle to move the ball in short yardage situations. That's why Gray is valuable. Travaris Cadet - Cadet needs to come back. It is now or never for him. That being said, I think he offers the most unique skills/body type out of the Patriots RBs. The Saints used him in so many alignments, split out wide, in the slot, out of the backfield, and in each one he was able to make plays with his impressive size (6'1") and his athleticism. Once Blount gets back it will be between him and the next guy for who is cut. Dion Lewis - Three receiving backs? Yes, three receiving backs. Lewis has done just enough to make the roster after being a long shot in early spring. His speed and quickness have wowed fans and his intensity and power have lead the Patriots into the endzone. (Julian Edelman) - No one should be concerned about Edelman. Reports have been saying that the Patriots have been playing it safe with Jules and that he has been healthy enough to play for the last several days. He will be good to go come week one. (Brandon LaFell) - LaFell has been seen at Gillette Stadium for the first time since training camp started this last week. Many are speculating that LaFell is destined for the PUP, but I'm not convinced yet. Nothing has been said by anyone with anything other than speculation that LaFell isn't on schedule to play week one. Even if he doesn't play week one, he should be back in a shorter amount of time than is worth him being kept on the PUP. Danny Amendola - Amendola continues to be a reliable target for both Brady and Garoppolo during the preseason. One of the most incredible things is that he has stayed healthy while his fellow receivers have not, despite him being the most injury prone of the group. If his health stays positive and he gets on the field, there is no reason to think he won't be able to perform for this team. Aaron Dobson - Finally back in the action, Dobson had an up and down third preseason game. He made big plays, but also had some lapses that resulted in negative plays for the offense. Once he gets back in the groove of things he will be the Patriots best deep threat and one of their most explosive playmakers. (Rob Gronkowski) - One of the best decisions the Patriots have made this preseason is keeping Gronk as far away from harm as possible. There are less than a handful of players more vital to a team's success and Gronk may be at the top of that list. Him at 100% with the other targets around him will allow him to dominate the league and impose his will. 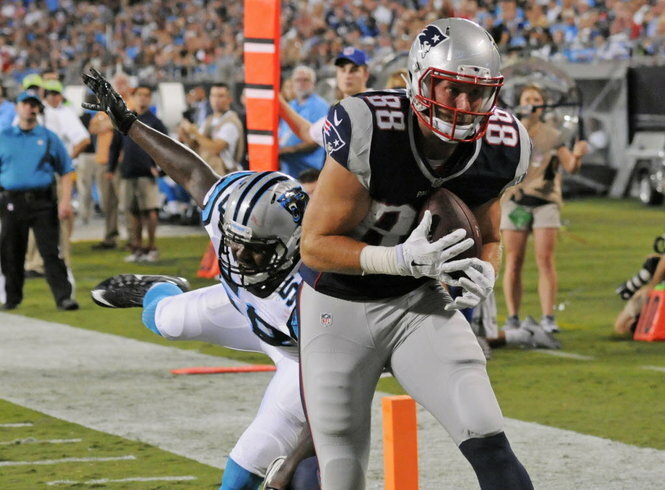 (Scott Chandler) - His fade route touchdown from Tom Brady was something to look forward to seeing often this season. Between him and Gronk the Patriots will be able to dominate the redzone using height and athleticism. Chandler may end up with the 3rd most receptions on the team if he stays healthy all year behind only Edelman and Gronk. Michael Hoomanawanui - There are two caveats to him being on the team. The first is Mike Williams. If Williams can prove himself to the coaching staff that he is a capable blocker with the ability to catch the ball when it is thrown to him, Hooman may be gone. The second factor is if the Patriots decide to add a FB to replace Develin. I find Hooman to be the most replaceable player on the roster right now and his leash will be short if another player can prove themselves superior. Mike Williams - When I first saw the trade for Williams I thought "Well here's another camp body", but then I read more into him. A former TE in college while he was at Alabama, the Lions attempted to convert him to Offensive Tackle. Now at 6'6" and 304 lbs, he is a mountain, and with his athleticism he could definitely push Hooman off the roster. (Nate Solder) - Solder continues to be a solid left tackle, and is playing for his next contract. Under his 5th year team option on his rookie deal, he likely remains the Patriots highest priority in terms of signing him to an extension. Would not be surprised if at some point this year we get news that Solder signed a deal in the 3-4 year range. (Sebastian Vollmer) - I think Vollmer is still not back to full health. Limited participation in practice and limited snaps in the preseason lead me to think that, especially since he likely isn't back at full strength from his offseason shoulder surgery. Still one of the best RTs in the NFL, he will just need some time to get back to form. (Bryan Stork) - With what information I have, I believe Stork suffered a wrist injury in practice and has not returned due to the Patriots staying true to their conservative approach with injuries. It is not a serious injury and Stork should be good to go week one to help solidify an offensive line that has been without an identity so far this preseason. (Tre' Jackson) - The most consistent of the young offensive linemen, Jackson has done a good job in the run and pass game so far. While he doesn't have the raw power that Shaq Mason has, Jackson has been able to protect the quarterback and move defensive linemen. If Wendell isn't good to go he should be marked down as a week one starter guaranteed. (Shaq Mason) - Mason has really surprised and improved upon his pass protection over the course of the preseason. While not perfect yet, Mason has made strides, and when you combine that with his strength and power, you get a promising rookie to look forward to. I don't know if Wendell will be back to form before the start of the season, but Mason may beat Wendell out regardless. Ryan Wendell - Should Shaq Mason or Cameron Fleming prove themselves a superior option than Wendell in camp, he may be looking for a new job. That said, as one of the senior-most players on the offensive line, Wendell is a needed commodity to have until a younger player is capable of starting. His ability to play guard and center also make Wendell a valuable player to have in case of an injury to Stork. The PUP list is a possibility if he doesn't return to full health soon. Cameron Fleming - Before the game against the Saints, Fleming was the only offensive linemen in the NFL preseason to not allow a pressure with a minimum of 60 snaps. That's impressive. I wasn't impressive with his lateral quickness, but his size and power allow him to get the job done. Should the Patriots feel the need to trade the next guy on the list, I feel that Fleming would be a capable swing tackle. Marcus Cannon - With the addition of Mike Williams, Cannon shouldn't feel overly comfortable with his roster position given his cap hits. While I don't expect him to be cut, he provides interesting trade bait should some team feel so inclined. Otherwise Cannon could be holding on to a roster spot for the foreseeable future. Josh Kline - One of the most versatile of the Patriots linemen, Kline can play any of the three interior line positions and do so admirably. Belichick loves this guy and he will likely be a much needed depth asset should injuries occur. (Dominique Easley) - This kid is special. If you've watched the preseason so far you know this. His speed is otherworldly for a DT. His power and ability to shoot the gap is elite. He has blown up run plays, sacked the quarterback, and has caused havoc all over the field. The sky is the limit for Easley and now is the time to show why the Pats took him in the first round last year. (Malcom Brown) - The thunder to Dominique Easley's lightning. Another stellar athlete on the front seven who can get to the quarterback and play the run. This could be one of the best draft picks in Belichick's history if he continues to do what we've seen so far this preseason. (Sealver Siliga) - Another key piece of the defensive line, Siliga provides a big body in the middle of the line and a good presence in the locker room. With all of the pieces the Patriots have on the DL, everyone should be able to rotate in and not drop in performance of the defense as a whole. Alan Branch - Many people have been critical of Branch, but he played well against the Panthers and was able to stay on the field for an extended amount of time. His size will be key in goal line and short yardage situations. Zach Moore - After starting off as a defensive end, Moore was asked to bulk up in order to become a versatile machine for the line. He has the athleticism to get after the quarterback and hold his own against the run. (Rob Ninkovich) - Seeing more time at OLB puts his true position in doubt. He has spent more time of late dropping back into coverage than ever before, and he looks like he shed some weight though I cannot confirm that. Regardless, as a leader of this defense he is a lock and will play considerably, rotating with the several players below him. (Chandler Jones) - Making plays against the run is a promising sign for Jones, who should finally become the player the Patriots drafted him to be. With the improved pass rush around him, Jones should see more one on ones than ever before, which are what he exploits best. (Jabaal Sheard) - The best free agent signing of 2015 by a long shot. Sheard could honestly be the starter at left defensive end over Ninkovich given how well he has played. He is a dominant force on the edge and will be a factor on passing and rushing downs. With a line of Jones, Easley, Brown, and Sheard quarterbacks will not sleep easy the night before a game. (Trey Flowers) - One of the steals on draft day, Flowers has shown us all what he can do. Taking down Aaron Rodgers and putting pressure on Cam Newton is a promising sign, and that's not even the best part of his game. Flowers will be a factor for this defense and someone opposing offenses shouldn't take lightly. (Geneo Grissom) - I list him as a DE though I'm honestly not sure where he fits best or where he will be used most. He can play at DT, DE, and OLB and has shown flashes of being able to penetrate the line and disrupt plays. (Dont'a Hightower) - One of the best linebackers in football, Hightower has a shot to continue to improve and earn his next contract with the Patriots. The fact that he has returned to game action after being in doubt to start the season shows how well his progress has gone since his shoulder surgery. (Jamie Collins) - Another superstar Patriots linebacker that will bring this defense to a new level when combined with the new additions. Collins has shown one glaring flaw this preseason and that has been his ability to cover RBs on wheel routes out of the backfield. Blitzing he remains a constant threat, but making him turn his back to the quarterback exposes him. That will be something to monitor during the season. (Jerod Mayo) - Mayo was a wrecking ball against the Panthers in his first action since his injury. His run stopping ability is unparalleled amongst the Patriots defense, and his leadership is unquestioned. If Mayo can stay healthy, this Patriots LB corps could be the best in the NFL. James Morris - Morris has quietly made several plays this preseason. The coaches love him and have given him play call responsibilities and the green dot on a few occasions. Unlike many other defensive players, Morris has base defense capabilities and can also contribute on special teams. Jonathan Freeny - A core special teamer who may come onto the field in passing situations if need be. Reports have said that he is a good teammate and the coaches love his effort, which are always sought after qualities for the Patriots. (Malcolm Butler) - The Patriots number one cornerback continues to display his skills in practice and in games. Belichick has given him the superstar treatment over the last few games with him being one of the first players off of the field. He was exposed a tad against Carolina when he fell for a double move (stutter step) which was his kryptonite last year. (Tarell Brown) - The Patriots wanted Brown since free agency started, and against Carolina we can see why. With several pass break ups and tight coverage, Brown looks like a starting corner across from Butler on opening day. (Logan Ryan) - When asked to play off man coverage he can be a good corner, when asked to play press man in bump in run coverage he can be exposed due to lacking elite speed. The slot seems an ideal place to try to see what Ryan can succeed at, but McClain may be the starting nickel corner to start. Bradley Fletcher - After receiving significant playing time against Carolina and receiving praise from Bill Belichick, it is a safe bet that Fletcher will make the final roster. He has been relatively average in terms of his play, but hopefully with time and a bit more developed defensive scheme he can make more of an impact. Robert McClain - One of the chippier players on the roster, McClain figures to start out as the starting nickel corner for the Patriots. His speed and quickness combined with his willingness to get involved in the run game make him an ideal slot corner. (Devin McCourty) - The captain of the defense and the leader of the secondary, McCourty looks to lead this new look secondary. With the experiment with him at corner over (at least as a permanent fix), he should look to play over the top this year as the free safety, though situations could call for him to come down to man up tight ends or running backs. (Jordan Richards) - One player that I can see stealing a returners job is Richards, who shined as the strong safety against Carolina. He showed his skills against the run, filling his gaps, making hard hits, and flashing decent coverage skills. (Duron Harmon) - The top free safety back up and someone who could see significant play time if the Patriots decide to go three safeties (which they've done several times this preseason). Harmon will replace Chung in obvious deep passing situations and will be called upon in key situations like he was last year. Patrick Chung - I honestly don't know how I feel about Patrick Chung. He's by no means a bad player, he often makes big plays, but at the same time I just see him being a step behind where he should be on almost every play. Chung is at his best when he's in the box with no coverage responsibilities. When asked to cover receivers, he is a liability. I think Jordan Richards will take over the strong safety responsibilities from Chung by the end of the season. (Stephen Gostkowski) - With a new deal, and no competition in camp, Gostkowski is one of the best kickers in the NFL, if not the very best. (Ryan Allen) - The lefty had an okay season last year after impressing as a rookie. After the contract extension, the Patriots have locked up their core special teamers for the near future. Joe Cardona - After receiving his temporary Navy service waiver, Cardona very well could become the best long snapper in the NFL. Hopefully his success will allow him to continue to put off his service and remain with the Patriots for the foreseeable future. (Matthew Slater) - Listed as a WR, Slater is the captain the Patriots need and is arguably the best special teams player in the NFL. Xzavier Dickson, LB/DE - The 7th round pick falls to the practice squad due to a plethora of other players at his position. His potential is enough to keep him around. David Andrews, C - The Patriots paid Andrews the most money allowable for an UDFA. Given that and the fact he can play all three interior line positions, his spot on the practice squad will keep him around for the Patriots to develop him. Darius Fleming, LB - With Dane Fletcher returning and James Morris being healthy Fleming becomes dispensable on the 53 man roster, but his experience will come in handy should the Patriots need a linebacker. Asante Cleveland, TE - While not a big guy, his special teams value and ability to catch make him a valuable asset to have. Rufus Johnson, OLB/DE - A large linebacker (6'5" 272 lbs) who can play both OLB and DE which provides the Patriots with more uses for him on the practice squad. He flashed his skills in the preseason game, and could fight for a final roster spot. Ryan Lindley, QB - With Matt Flynn joining the Jets, the Patriots will need to have an extra arm in practice for the scout offense. Unless he is replaced by another QB, I could see this being his destination. Casey Walker, DT - The last time Walker was on the team the Patriots wanted him to remain on the practice squad, but the Ravens claimed him. Hopefully this time he can stick around. Chris Harper, WR - An UDFA who fits in as a slot receiver in the offense. He has impressed in the preseason so far, but could really use a year learning and building up his strength to become a true factor for the Patriots next year. Dax Swanson, CB - With the current depth, it seems unlikely that the Pats will keep more than the five CBs they have, but Swanson has shown promise and has spent the last year in the system, making him a valuable player. Tyler Gaffney, RB - I had hopes that he would make the roster, but yet again his season is cut short by injury. No one knows what the injury is for certain, but the last time we saw Gaffney playing was him getting popped hard and taken to the ground by Sealver Siliga. The next time we heard of him he was being placed on IR. AJ Derby, TE - After being a favorite of several draft analysts, Derby was placed on IR for an undisclosed injury. This will be a redshirt year for Derby, who will have a chance to make the roster next year, when Hooman's contract is over. James Develin - Having a clean break of his tibia is about as unfortunate as it gets for one of the toughest Patriots. In a tweet Develin stated that he would try to get back for the "new season", what is unclear is if he has any idea if he could return this season or not. I find it unlikely that he isn't at least placed on the IR Designated to Return, but even then I find it optimistic. He may require a rod to be put into his bone. We can only hope for the best for Develin going forward. Brandon Gibson - This injury was brushed over by many, but I had anticipated Gibson to make this roster and have an impact. His loss not only is unfortunate for the Patriots, but could be career threatening for Gibson who has now torn both ACLs. Darryl Roberts - It is not clear how severe Roberts injury is, but reports have said that it could be season ending. One scenario is that the Patriots wait to put him on IR so that he does not have to pass through waivers where another team may claim him. Otherwise there may be some hope that he returns this year. More information will be needed to determine where his season is headed. Brian Tyms, WR - Before getting injured, I had Tyms being on the practice squad due to the plethora of WRs on the roster and Tyms falling behind in the depth chart due to drops and mediocre routes. Given his journeyman age and struggles, I wouldn't expect him to be involved heavily in the Patriots' future plans. Jake Bequette, TE/DE - It surprised many people when Bequette outlasted notable TEs such as Fred Davis and Tim Wright, but an injury has sent him to IR. He could return next year, but it wouldn't surprise me if the Jake Bequette project is over. Dane Fletcher - A return back home brings Dane Fletcher back into the fold with New England. A year of contributing quite a bit in Tampa Bay gave Fletcher more experience as a base defender which gives him more value than as a pure special teamer. Rumors have been that he will begin the season on the PUP list, opening up another roster spot for the time being. Chris Jones, DL - Despite giving the Patriots a capable DT for the past two years, Chris Jones will be supplanted by the likes of Malcom Brown. With the Patriots investing in Casey Walker, and no sign of Jones at camp, it may allow the Patriots to leave him on the PUP list until they have to make a decision on him. Tavon Wilson, DB - Wilson has come on the last few days in camp, and has shown what he can do. Unfortunately for him, it may be too little too late. Could very well get a roster spot over someone like Jonathan Freeny, but at this point I'm not convinced. Eric Martin, LB - You cannot make the club from the tub. Despite having an impressive start of training camp, his injury has kept him out in a pivotal part of the preseason and he has fallen behind. Jimmay Mundine, TE - An athletic weapon that could be used as an H-Back. His college highlights are impressive, but a quiet camp leads to him being cut, though he could have a shot at the practice squad. Brandon King, DB - An UDFA who faces a tough road to making it on either the roster or practice squad. He's been working at LB as well, giving him a unique identity. Chris Barker, OL - The following three offensive linemen all have potential to become members of the practice squad, but with the depth the line now has with their rookies, players like Barker will be forced off the roster. Chris Martin, OL - After being claimed off of waivers from the Dolphins, former Patriot Chris Martin is another plug and play OL for the depleted Patriots line. Caylin Hauptmann, OL - One of the few players that has been highly spoken of from the past few months out of the linemen. Hopefully he surprises people and makes the practice squad. Joe Vellano, DL - With the youth and talent at DT make Vellano replaceable. Sad to know we won't see him being pushed five yards off the line of scrimmage this year. We haven't seen him in quite a few days, which could make him an IR candidate. Josh Boyce, WR - A once promising player has been hurt more than he has been healthy, and drops have been even more constant. Potentially a practice squad candidate, but his struggles so far this summer make that unlikely. Jonathan Krause, WR - Another slot WR who will potentially battle for a practice squad spot. A.J. Pataiali’l, DL - A camp body at DT who is currently filling in for Chris Jones and Joe Vellano. Tony Creecy, RB - Camp body to fill in for the loss of Gaffney and with Travaris Cadet banged up. Dekoda Watson, LB - A relatively quiet summer so far leads him off the roster for players like Eric Martin and James Morris who have higher upside. Zach D'Orazio, WR - On and off the roster this offseason, he has a chance to make the practice squad, but it looks like Chris Harper and Tyms have a leg up on him. Nate Ebner, DB - After several years as a special teams ace, with his contract set to expire and other players capable of filling his role with defensive upside, it is time for Ebner to move on. DJ Lynch, LB - On and off the team is never a good sign. He is filling in for injured players, but with all three starters back, his time is likely at an end in New England. Here is a visual look at the potential starting offense and defense for the Patriots. Please note this is in a simple base 12 personnel offense and 4-3 defense. Several players not shown will see significant snaps. These players include Logan Ryan, Duron Harmon, Jabaal Sheard, Jordan Richards, Bradley Fletcher, Darryl Roberts, Sealver Siliga, Alan Branch, Robert McClain on defense, and Aaron Dobson, Michael Hoomanawanui, James White, Reggie Wayne, Dion Lewis, and Brandon Bolden, among others. Feel free to tweet at me or comment your thoughts. I appreciate the feedback and enjoy other perspectives. Thanks for reading.